A theme for professional food bloggers. Looking to share your love of food with the world? Whether you’re blogging about your own recipes or reviewing delicious food around town, you need a WordPress theme that sets you up for success. With its food-friendly features and focus on visual imagery, Epicurean is that theme. Build your social media following, share stylish recipes, customize your theme, and tons more. All without needing any special knowledge! Want to really make your site…yours? Epicurean puts you in the driver’s seat by letting you choose from a variety of different homepage layouts and post formats. 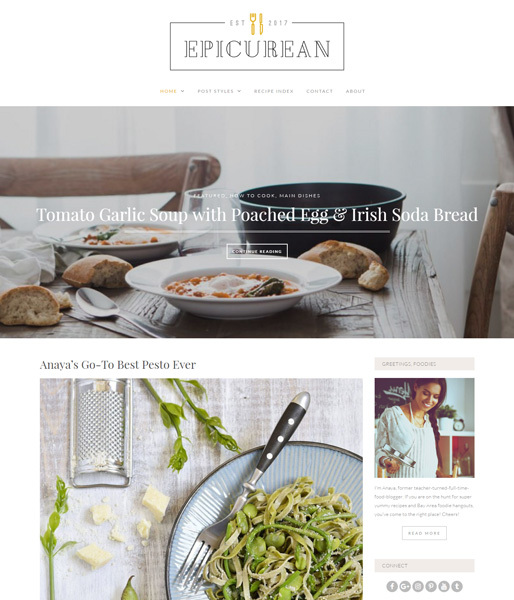 Epicurean comes with 3 different frontpage layouts that you can use to showcase your latest posts. Each of these layouts includes a bold full-width banner to showcase your most important posts. Then, for each individual post, you can choose from one of the 9 custom post formats, including dedicated options for audio and video. Whether you need to share an image gallery or a YouTube video, there’s a dedicated post format for you. No code knowledge? No problem! Epicurean uses the native WordPress customizer so that you can customize your website in real-time without needing to know any complicated code. Whenever you make a change, you’ll see the result right away in a live preview so you know exactly how it will look in the real world. If you’re planning to showcase recipes on your food blog, Epicurean bakes in support for the WP Ultimate Recipe plugin to give you a simple, and stylish, way to share helpful recipe information. Instead wasting time formatting each individual recipe, the plugin handles everything for you. It saves you time and makes your recipes easier to read. That’s a win-win! And because Epicurean has built-in support, WP Ultimate Recipe looks pixel-perfect as soon as you install it. No need to hire a developer to customize its styling. First, you can easily add social media follow buttons to various areas on your food blog. Then, you can take it one step further and add social sharing buttons to your individual posts. And finally, Epicurean rounds things out by letting you easily display a super stylish photo feed from your Instagram account in the footer or sidebar widget areas. All the helpful food blog features don’t matter if the foundation isn’t rock solid. That’s why we made sure Epicurean follows code standards. A well-coded site performs better, is more secure, and works with all of your favorite plugins like W3 Total Cache, WP Supercache, Yoast SEO, and more. Ready to start making your readers’ mouths water? Pick up Epicurean today and you’ll be blogging about food in no time!